Phoenix, Arizona, April 15, 2019 (GLOBE NEWSWIRE) – WHAT: Jami Snyder, Arizona’s State Medicaid Director; Will Humble, Executive Director of the Arizona Public Health Association; Jamo Rubin, Founder, and CEO of TAV Health; and, Monique Delgado, Senior Vice President of Q Point Operations will describe forward-thinking and value-driven approaches from a state, public health, community, and provider network perspective. This program is being conducted as a live stream, interactive session. Attendees will be invited to submit questions before the event, and they will also have the opportunity to ask questions during the webinar. WHEN: April 16, 2019 (Tuesday); Time: 12:00 p.m. – 1:00 p.m. MST (Arizona, GMT-07:00). Duration: 60 minutes, including a question-and-answer session. Attendees can earn 1 CEU provided by the National Association of Hispanic Nurses. 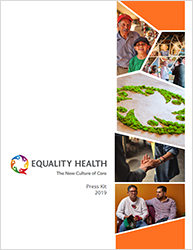 Equality Health, LLC is an Arizona-based integrated, holistic healthcare delivery system focused on improving care delivery for diverse populations with culturally sensitive programs that improve access, quality, and member trust. Through an integrated technology and services platform, culturally competent provider network and unique cultural care model, Equality Health helps managed care plans and health systems improve care for diverse populations while simultaneously making the transition to risk-based accountability. For more information about Equality Health, visit www.equalityhealth.com or follow @EqualityHealth on Facebook, @EqualityHealth on Twitter, and @EqualityHealth on LinkedIn.